Ever wondered about DIY homemade hamster cages? As you probably know, hamster cages can get a little expensive. It’s pretty hard out here for a hamster owner living on a budget. 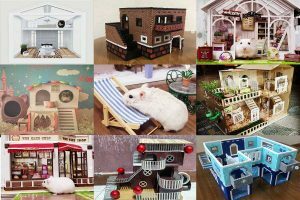 Due to this, I thought you could benefit from an article depicting an effective way of using household items to build a high-quality cage. 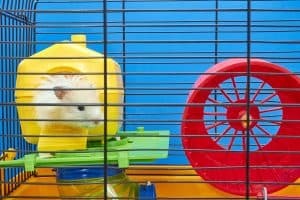 How do you create a hamster cage with only household items? Well, it’s pretty simple as it only requires a few supplies and a little bit of your time. All you need is a storage bin, a water bottle, washers/nuts/bolts, wire mesh, wire and a wheel to get started. Once you have all your materials, it’s time we start outlining the step by step process of creating your own hamster cage. Keep reading for the complete instructions. Before we get into the actual step by step process, it’s essential we go over necessary tools you’ll need. By doing so, we’re making sure you’re prepared for this gratifying and cost-effective experience. As previously mentioned, the materials you’ll need are stuff you mainly find around the house. Each one of these materials has a specific purpose that you’ll need to understand for this project to be successful. Storage bin: It should be a clear bin that’s at least 20 X 30 inches. This is the minimum measurement for a comfortable living environment for one Syrian hamster or two dwarf hamsters. Larger is better. Wire mesh: A 19 or 23 gauge roll should be enough to create the windows of the cage. A pet water bottle: I’d recommend this one. It’s easily one of the best on the market. Wire: A foot long length should be enough to secure the water bottle inside the cage. Washers, nuts, and bolts: About 16 of each should do the trick. These will help fasten the mesh to the lid, which will create windows. A plastic wheel: A 11 or 12 inch one for a Syrian hamster and 8 or 8.5 inch one for a dwarf hamster. As previously mentioned, each of these material does have a significant purpose in creating a high-quality bin cage. So, make sure you have all of them before moving on with your project. Now, there are a few items on this list that you might not have inside home. If this is the case, don’t fret. The cost of the following tools will be a lot less than the overly expensive hamster cages available at pet stores. Wire cutter: You’ll need one to cut the wire mesh. Some sort of utility knife or saw: Depending on the material of the storage bin, you’ll need either a utility knife or a saw to cut through it. Drill and bits: A 11/64 sized drill bit should be satisfactory enough to create both the ventilation holes and the water bottle spout hole. A sharpie or permanent market: This tool will be used to draw your windows to help guide your cutting. With all your tools and material ready for use, we must onto the actual step-by-guide to creating this DIY hamster cage. And honestly, getting all the tools/material was the hard part. Once you got these tools, the rest is of the process is so simple a hamster could do it! First, you’re going to take off the lid and have the bottom facing up. This action will allow you to examine the lid for any weird, potential dangerous plastic pieces. After you conclude the lid is safe for this project, it’s time we start preparing it for the cutting session. You’re going to want two windows with a strip in between because the strip prevents them from losing strength. Also, you’ll need a little room for the screws you attach later. So, you should leave about an inch and a half on each side and about 3 to 4 inches in the middle. Once you consider these factors, take out your sharpie or permanent marker and start drawing the two rectangles. These rectangles will make cutting a whole lot easier. Now, the cutting will most likely be the most challenging part of this entire project. So, carefully take out your utility knife or saw and start cutting according to your rectangle guidelines. After you’ve successfully cut out the rectangles, move onto the next step. Take out your 19 or 23 gauge of mesh and line it up against the rectangle windows you’ve just created. Now, you’ll need to make sure there are at least four mesh holes or about inch overlapping the window. See, you’ll need this extra room later when you start drilling holes. After all, if you drill too close to the window, it might end up cracking, and that’s the absolute last thing we want. Once you’ve measured out the right amount of mesh, take out your wire cutter and start cutting. When you’re down cutting your mesh, it might be in your best interest to file down its sharp edges. If you have toys or tunnels that reach the top, these sharp edges could end up hurting your hamster. Pick up your newly cut mesh and decide which window you want to start with first. For me, I’d probably start on the right side first given I’m right-handed. Then, place one piece of the mesh over the window and make sure it’s centered. If it’s not centered, it could cause some problematics issues later on that you don’t want to encounter. From there, pick up your marker and start filling in the holes where you think the drill holes would work best. I’d recommend starting with the top corners and working from there. After this, the process becomes rather simple. You drill the hole where you marked and thread a screw through. Then, you put the screw through the hole, twist a washer on it from the other side of the lid and tighten the bolt. And you repeat this process until you’re comfortable that the window is secure. In my opinion, eight screws in on each window should be enough. With the first window safely secure, move onto the other window and repeat the entire process. 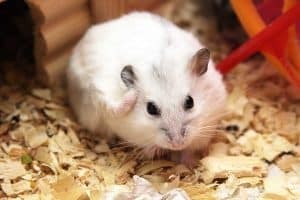 With your lid is completely finished, it’s time to give your hamster or hamsters some breathable air. Although this step isn’t strictly necessary depending on the size of your windows, I’d still recommend added these holes. After all, it’s never a bad idea to give your hamster more air circulation. And to add these holes isn’t a complicated process. In my opinion, the holes you drill should be in two places: one set near the top and another near the bottom. Now, the key is to find the perfect places to drill these holes. With a 20 X 30-inch storage bin, I’d recommend drilling holes about 3 inches from the bottom. This amount of space will allow you to avoid the holes getting blocked by your hamster’s bedding. Regarding the top layer of holes, you should drill a layer of holes about an inch below the lip of the lid. With both these layers of holes, your hamsters shouldn’t have any issues inhaling that all-important fresh air. Deciding where the pet water bottle’s placed is a surprisingly difficult decision. Honestly, there are minimal guidelines for its placement because every pet water bottle is vastly different. In the case of the water bottle I recommended above, I’d put the spout about one or one and a half inches about the bedding. This placement will ensure there’s no contact between the bedding and water spout. Once you do decide about the placement, put the bottle flat against the spot you want it placed. Then, use the marker to draw four dots: two on either side of the bottle. These dots on both will be on top of one another. In other words, if all four are connected, they would form a rectangle. These dots on opposite sides of the bottle will be about an inch or so apart. After drawing these dots, you’re going to draw an oval-shaped hole for the water bottle. Make sure this hole is a little bit taller than you need to be, so, you can easily pull the bottle in and out. When you got all your dots situated, you need to drill through them. When the drilling is done, take your wire and thread it through the now drilled holes. It’s essential you put the wire into a U shape then push it through the upper holes first. After this, pull each through the accompanying bottom holes. From there, take one of the wires and twist it over its self a few times before making a loop with its end. With the other wire, you do the same except you make the end a hook instead of a loop. Once you’re done making the loop, you can attach the pet water bottle to the cage and fill it up. We’ve finally reached the fun part. At this juncture, your cage is already to go. All you need to do from here is add in your hamster’s decor. Add in all the essentials such as bedding, wheel, food dish, toys, etc. Put in whatever you need to make your hamsters feel comfortable. And once you add in this stuff, you have your own inexpensive cage that will be your hamsters home for a very long time! And this video isn’t the only one out there that has some great ideas about hamster toys. Getting creative is half the fun! Just please remember to use only non-toxic materials.